Dresses are not my favorite article of clothing during the cooler months. Too much work and you get the freezing cold air blowing up from the bottom and the tight tights which really do very little in the way of keeping me warm. However, when warmer weather arrives, easy dresses are my go-to for looking pretty and feeling cool with no effort what so ever. A little too much showing up top? Throw on a cardigan as shown in #3 below. And really, who doesn't love the fact that maxi dresses are still in style? 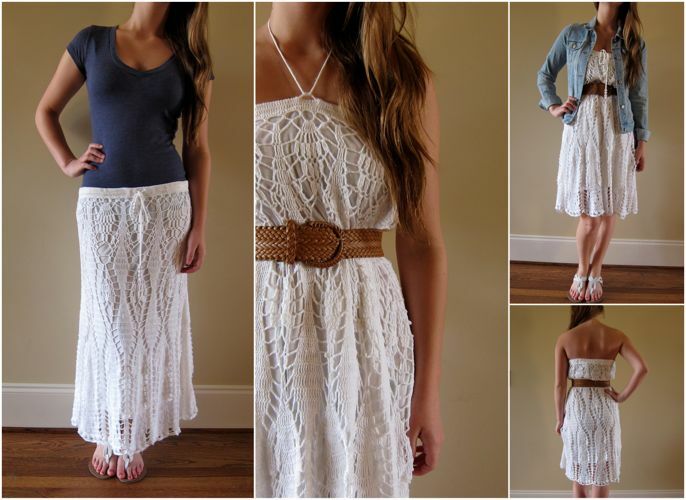 We turned this crochet summer maxi skirt into a sweet summer dress. Are you a dress girl? What's your warm weather go-to? I love wearing dresses and adore the maxi dress. Sadly, short and chubby girls do not look nice in maxi dresses. I love maxi dresses, I have winter ones and summer ones. Recently though I have become brave and the hemline has started to go up on my dresses. I love the pencil skirts, because I'm short they fall just under my knee which appears to be a flattering length for me, I love happy accidents like that.